meh i only play twice a day and if i have time to visit the gf i will, I'm not that bothered about it. I play enough to just about hit my weekly goals but i spend the rest of the time stocking up. I don't do the bonus stuff. level 296. I play daily but zynga only. With the recent changes I've noticed that the seving size of the wines have now increased by 1 or 2. Most every thing else is unchanged except for credits. The fermentation time of the bonus wines has also doubled to eight hours. I also added [to my copy] a sheet with wines sorted by serving size. i must say, all most of you people do is complaining..
i just started to play this game like a month ago, i´m already level 40, i never paid cash money to get what i want, i just play the game! the only benefit i see in the gf are the bonusses you can earn (which i yet have to use), visit the gf every 6 hours cos my type of wine takes 6 hours to make! do i bother with every other nonsence.. not at all! gf is just a bonus level, take your bonus and keep it moving! Well, I've been playing this game for 4 years and I am at level 234!!!! I remember when it was a fun little game where all events and quests could be completed in a reasonable amount of time. Things have changed and in some respects not for the better. Glitches, Bugs with most everything at one time or another. Rise in difficulty. If you want to finish most of these events and quests plus planting, fertilizing, watering crops, drying crops, feeding animals, co-op and the GF, etc. It takes hours per day every day. This FV2 has turned into a lifestyle not just a game and I object and will continue to object as long as I play this game. If you don't like the "complaints" then ignore them because they are not going to stop until Zynga gets the message which is; this can be fun but with every new thing it gets more time consuming, more frustrating more buggy, more expensive and less fun. 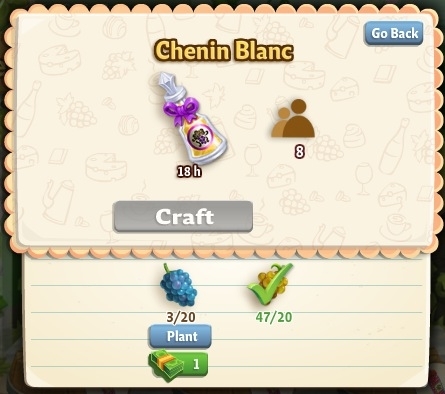 Has anyone got the recipe for Level 20's Chenin Blanc? So I've now reached RP 10 and have access to more wines. I've noticed these wines have again had their servings increased, but by a bit more than just +2. The recipe is pretty much not worth it. The special wines at the end of the week you might want to cache for, but they only give 2-4 credits per round and take a fairly long time. When did the Wine Counrty start and at what level in FV2 does one have to be? I just started replaying after 18 month absence. I have other friends that have it and just curious. I loved this game - and wish it would come back. I wish I had found your spread sheet earlier.